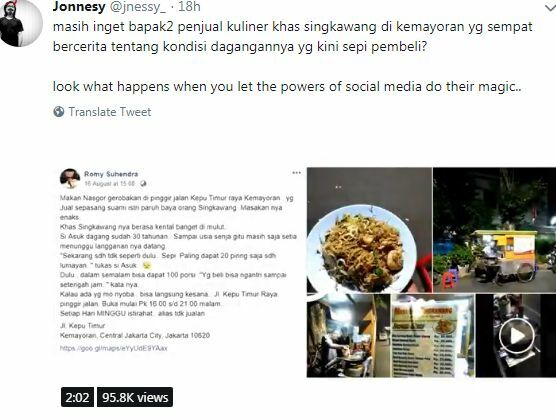 Have you heard about the recent hype of Singkawang fried rice vendor in Central Jakarta that went viral overnight? Operated by an elderly couple named Asuk and Ai, they became a new internet sensation due to a posting by Indonesian netizen Romy (@jnessy). He tried the fried rice and had a chat with the couple several weeks ago – there he found out that the couple have been selling since 30 years ago, but these days, they can only sell around 20 portions per day while previously they can reach 100 portions per day. Romy then shared about the fried rice vendor on his social media, while inviting other to visit them. The fried rice is authentically Singkawang style, and he claimed it to be totally delish. Thanks to the power of social media, Asuk and Ai went viral overnight on Youtube, and Twitter. Today, if you pay a visit to their humble cart in Kepu Timur, Central Jakarta, you’ll see people flocking there, waiting to be served. Some even claim they can wait up until 2.5 hours before being served since so many people went there.